Mary Jane (Bruske) Blau passed away peacefully on Monday, November 30 after pruning her beautiful rosebushes in her garden with her sister Madelyn. She was 75. Jude Blau, loving husband of Mary Jane, passed away peacefully in their home on Thursday, December 3, surrounded by family. He was 84. 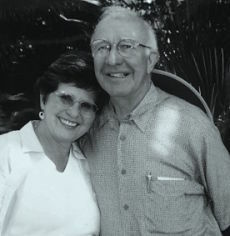 Passing away three days apart was just like them, for they were an extraordinarily loving couple, at turns sweet, considerate, and playful, always devoted to one another. They had just celebrated their 39th anniversary on November 13—a veritable parade of friends descended on the house to pay their respects. They also enjoyed a lively, fun Thanksgiving dinner two weeks later. Up until the very moments of their deaths, they were tender and brave as they basked in the company of their family and friends, sharing memories, meals, hugs, and laughter. Jude and Mary Jane met in Santa Barbara through her sister Madelyn. After a brief and romantic courtship, they wed at San Roque Church in 1976; dear friends contributed music and readings. They settled in Goleta, but later moved to Santa Barbara. Their home was constantly swirling with family, friends, neighbors and, at times, foreign students. They adored traveling. Visiting friends and family, and attending school reunions was a priority because they believed in nurturing lasting relationships. They also got to visit Monaco, London, Italy and more, toured the Hermitage Museum in Leningrad, Russia, and took scenic cruises (Alaska, Gulf of St. Lawrence). Every adventure—the journey and the destination—was embraced with gusto and savored long afterwards. Both of them were lifelong learners, avid readers, and “culture vultures.” Opera was a special favorite for Jude; he knew the words and got emotional during dramatic passages. Mary Jane, a musician herself, especially enjoyed the Santa Barbara Symphony. In later years, their favorite activities included simply relaxing in the garden in the evenings, watching British detective shows in the living room at night, or puttering around straightening up while listening to classical music on the radio. Always there was love and plenty of it. Theirs is a legacy of gentleness, generosity, and empathy, which they shared with everyone with whom they came into contact—partly as a result of earnest, conscious efforts to live out their convictions, but also just because that’s who they were. Mary Jane was born in Detroit, Michigan to Henry and Stella Bruske. She was predeceased by sisters Shirley and Betty and brother Bob, and is survived by brothers Tom and Dan and sister Madelyn, and a large and beloved extended family. She was raised in Detroit, and entered the Adrian Dominican Convent after graduating from high school. She earned a Bachelor’s degree in Education from Siena Heights University in Michigan. In the early 1970s, she came to live in Santa Barbara, and cared for Madelyn’s children, allowing her sister to work. Later, she held a variety of jobs, including hairdresser and elementary school teacher at San Roque School. In her life with Jude, Mary Jane was a homemaker in the truest sense of the word. Their house was cozy and welcoming. Out back, she tended a colorful garden that grew lush with vegetables, herbs, fruit trees, and flowers. When she worked at Santa Barbara Orchid Estate, many spectacular orchids were added. It became a sanctuary for them, their families, and visitors as well as birds and other wildlife. Whether lounging in the garden or gathered around the large kitchen table, everyone in Mary Jane’s orbit felt completely welcomed, listened to, and cherished. Jude was born in Hamilton, Ohio to Joseph and Helena Blau. He was predeceased by sisters Joan and Shirley, and is survived by brothers Jack and Jerry and sister Sue. Jude began college aiming to become a physician but eventually earned a Bachelor of Science degree from the University of Dayton, Ohio. That story—one he shared often with his children as they encountered their own adult challenges—was one of disappointment, perseverance, and triumph. Jude then served in the United States Navy in Philadelphia, was honorably discharged in 1958, and moved to sunny California. He married Frances Colborn in 1960 and they had six children. They later divorced. He worked for Schering-Plough Pharmaceuticals as a sales representative from 1960 to 1996; his sharp intellect and vibrant personality made him a standout in his career. He won many accolades and awards, including a luxurious European cruise that he and Mary Jane remembered in detail and with delight. Upon retirement, Jude devoted himself to diverse volunteer activities, including serving food at a soup kitchen, hospice, and the American Lung Association. He had strong political convictions, supported and promoted candidates he believed in, and even wrote the occasional passionate Letter to the Editor of this newspaper. He was also a docent on the Amtrak Coast Starlight route. He got a big kick out of telling and hearing jokes (including—it must be said—old ones and bad ones). He loved pizza, football, going to plays at the Circle Bar B Ranch, and long walks and talks along Shoreline Drive with his dear friend Keith Forster. He seemed to know people wherever he went and struck up conversations easily; he was exuberant. No doubt his arrival in Heaven will displace Saint Peter as the greeter! Jude and Mary Jane are also survived by six beloved children, Teri Chace (husband Alan), Joseph Blau (wife Kathleen), Frank Blau (wife Linda), Eileen Horne (husband Greg), Julie Pascal (husband Roger), and Jim Blau, nine cherished grandchildren, Wes and Tristan, Kimberly, Peter, and Joshua, Caitlin and Justin, Lily, Stephanie and Danny, and Seamus, one great-grandson, Cade, as well as a special niece Rosemary (wife Linda). Jude and Mary Jane were blessed by many, many friends, most especially everyone in Saint Anthony’s faith community. A Memorial Mass and reception was held on Sunday, December 6 at St. Anthony’s. A private Memorial Service and inurnment will be held later. The family wishes to thank to all the loving hospice caregivers, especially Janet Bondarenko. They ask that in lieu of flowers, contributions be made in Jude and Mary Jane Blau’s names to Assisted Home Health & Hospice Foundation, 302 North Milpas St., Santa Barbara, CA 93103 or via its website at assisted1.com.